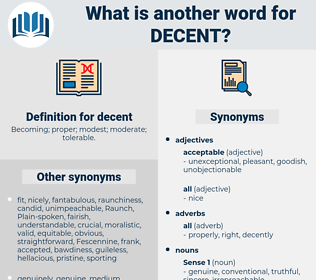 What is another word for decent? Becoming; proper; modest; moderate; tolerable. respectable, best, better, good, presentable. proper, satisfactory, honest, acceptable, correct, sensible, honorable, nice, sufficient, reputable, commendable, excellent, fitting, tolerable, deserving, convenient, comfortable, expedient, proportionate, inappropriate, worthwhile, civilized, sound, honourable, legitimate, pleasant, credible, civilised, right, modest, wholesome, generous, satisfying, rational, fine, equitable, polite, law-abiding, meaningful, respected, reliable, fit, noteworthy, noble, pertinent, genuine, common-sense, significant, sweet, respectful, ordinary, accurate, justifiable, affordable, normal, desirable. adequate, reasonable, worthy, appropriate, suitable, fair, humane. unaccommodating, improper, inappropriate, unrespectable, unsophisticated, unreliable, Misbehaving, ungenerous, incorrect, insufficient, unkind, untrustworthy, unsuitable, unsuited, disobliging, poor. unfit, bad, unacceptable, unsatisfactory, unreasonable, incompetent, inferior. grand, roguish, sullied, supreme, swell, proscribed, blameworthy, defective, unscrupulous, top-notch, soiled, inadequate, ungraceful, spare, unclean, informal, lamentable, forbidden, exceptional, superb, immoral, par excellence, pitiful, outlawed, fine, short, tasteless, dissolute, scoundrelly, dissipated, divine, skimpy, marvelous, casual, boss, disagreeable, niggardly, Dissatisfying, terrific, premium, profligate, faulty, superlative, imperfect, prohibited, optimum, reprobate, neat, lacking, fancy, sterling, mean, exquisite, fallen, first-rate, miserly, keen, tip-top, erring, high-grade, degraded, groovy, knavish, blamable, seedy, unrefined, demoralized, classic, barred, Interdicted, tarnished, intolerable, great, tacky, decadent, unchaste, first class, depraved, banner, superior, unworthy, degenerate, meager, supernal, insufferable, capital, incomplete, loose, peerless, perverted, preeminent, unbearable, unfair, evil-minded, fabulous, matchless, grungy, maximum, stellar, special, stingy, maximized, debauched, optimal, heavenly, unendurable, venal, extreme, prime, unprincipled, blemished, useless, defiled, sensational, wonderful, corrupt, rascally, blackguardly, unsurpassed, libertine, dandy, tainted, jim-dandy, stained, awkward, cheap, unjust, banned, culpable, noble, top, spotted, debased, nifty, scanty, atrocious, splendid, unmatched, shabby, A1, unparalleled, gauche, crackerjack. When you can find her a decent home, if she wishes it, she can come. In fact she's been rather decent. detachment, doughnut, dehiscent, dissonant, dismayed, decimate, discount, documented, discant, descant, dig into, dissonate, discussant, designed, dissent, Docent, desmid, dignity, desquamate, descend, disunite, descent, Djanet, designated, disunited, disjointed, disseminate, discommode, desiccant, Deoxygenate, Desmond Tutu, dismount, deckhand, duty assignment, disownment, document, dockhand, disjoined, disunity, decant, disjoint, dachshund, designate, Dika Nut, disowned.